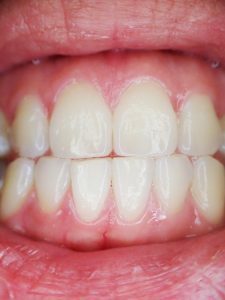 Receding gums is actually a fairly common dental problem. It’s a condition where the gums that surround the teeth wear away or get pulled back exposing more of the tooth or the tooth's root. Receding gums is actually a fairly common dental problem. It’s a condition where the gums that surround the teeth wear away or get pulled back exposing more of the tooth or the tooth’s root. Gum recession usually takes place gradually which is why people often don’t realize that they have it. One sign is that your teeth may feel more sensitive than normal or perhaps you notice that one tooth looks a bit longer than the others surrounding it. Improper or neglected dental care – Inadequate brushing and flossing makes it easy for plaque to turn into calculus (tartar) that builds on your teeth and can only be removed by professional cleaning. Periodontal disease – These are bacterial infections that can cause damage to your gums and the supporting bones that hold your teeth in place. Aggressive tooth brushing – If you brush too hard or if you brush the wrong way, it can cause the enamel of your teeth to wear away and gums to recede. Misaligned teeth – When teeth do not come together evenly, too much pressure can be placed on the gums and bones. Grinding and clenching your teeth – Putting too much pressure on your teeth can wear your teeth and gums. One of the best ways to prevent gum recession is to simply take good care of your mouth. If you brush and floss your teeth every day and see your dentist at least twice a year you are on your way to prevention. Always remember to use a soft bristled toothbrush and ask your hygienist to show you the proper way to brush your teeth if you’re unsure. If grinding and misaligned teeth are the cause of your gum recession, talk to the dentist. Typically, your dental hygienist can treat mild gum recession by deep cleaning the affected area. In other instances, gum surgery may need to be carried out in case of advance gum recession. Your dentist will advise you regarding the treatment which will be best for you. Keep a look out for changes that occur in your mouth and take note. Eat a well-balanced healthy diet. Quit or don’t start smoking or using tobacco. Of course, everything begins with a trip to your dentist. So make your appointment today with the professionals at Longmeadow Family Dental Care. Fixed partial denture featuring conservative retainers which are resin bonded to abutments.